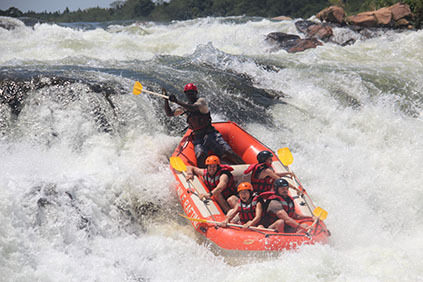 White water rafting is one of the most amazing water fun in Uganda. Uganda being the only country with the source of the longest river in the world about 6700kms length. It isn’t just about White water rafting, there is so much more. In addition to rafting you can kayak the Nile, The source of the Nile is about 70kms away from Kampala city center and this takes you about 2 hrs to get to Jinja town. There are 3 recommendable white water rafting companies that you can be associated with. The Adrift, The river Nile explorers and the Nalubale rafting. These companies offer full day and half day rafting experiences. At a cost of US $125, you will raft the grade 5 and more other rapids till the end and should you need a half day, it is absolutely possible. This water fun activity requires you book in advance by emailing them or call them to have you included on the list. However recommended you pay on arrival the day before the rafting experience. Auto rental Uganda can as well book this for you on request. So much fun awaits you at this longest river including grade 3 full day rafting, water floats and grade 3 two day rafting. This activity begins at about 10am and ends at 5pm a distance of about 30kms. Depending on the number of rafters, you will share a boat and if you are a group of friends you can ask to have your own boat. As always there is a safety boat to hold on to the medical first aid for rescues and so are the safety kayaks. Usually before you get to the rapids, the safety boat goes first on the rapids which never flips and half of the safety kayaks follow. Boat per boat goes past the rapids as the safety kayaks keep an eye on any of the boat that flips over for immediate rescue. After all boats are gone past the rapid, then the remaining half of the safety kayaks follow as well. Because you don’t go with your camera equipment, to capture those moments, you don’t need to worry. There is always one of the kayaks who goes fast before you and when he gets a good spot to shoot, he does randomly to every boat and at the end they will sell you the shots and videos you like. If you were 6 pax on one boat with a guide, you will need to divide the price among-st yourselves. Usually a group album carefully selected will cost USD $80 and the whole group will divide that to have a full copy. In the end of the rafting, there is always barbecue and drinks to refresh as you warm up to head back to your accommodation. The rafting company takes care of the transport to and from the rafting sites and all the refreshments. There are numerous hotels in all categories to fit your budget in Jinja. Did this interest you? contact us and lets take you White water rafting on the longest river in the world.